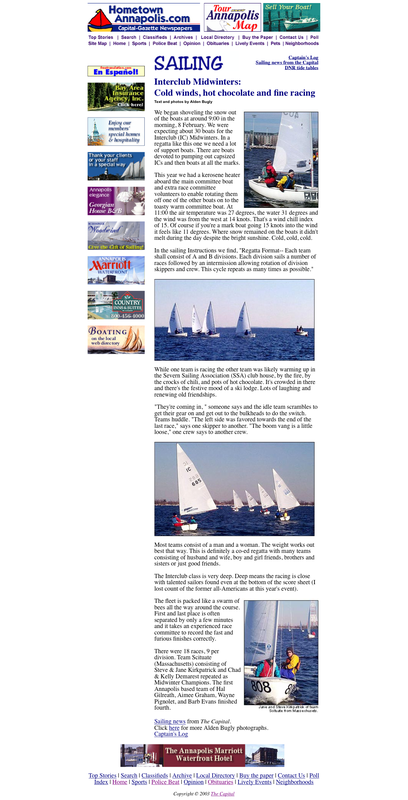 Another Great Regatta was held on February 8-9, 2002! How much better can you state the essence of this regatta? This year’s event is stacking up to carry on this tradition. As we have bragged about in the past, we have not lost a midwinter’s race due to bad weather in the last 5 years. You are virtually guaranteed two days of great sailing, and with the borrowed boat program (see the NOR), and air fares reaching rock bottom, you can now get here with a minimum of fuss. 29 boats braved the freakish snow storm that hit the Mid Atlantic with 8 inches of snow. We completed 18 races in two days in shifty NW-SW breezes. Team Scituate consisting of Steve/Jane Kirkpatrick and Chad/Kelly Demarest repeat as Midwinter Champions.